If you are a medical student, you would definitely know that medicine is the most important subject for doctors. The reason is that, you cannot become a doctor if you don’t know about diseases, their causes and treatment etc. Therefore if you are a medicine student or MBBS student or a post graduate, at all levels and in all fields you would need medicine books and review books. Previously we had written a review of pocket medicine pdf which is another great resource for students, post graduates and doctors as well. Today, i am going to review another most demanded review book of medicine that is called step up to medicine. 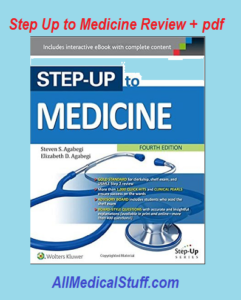 You can read my review of this book, its features and finally you can download step-up to medicine pdf forth edition for preview purpose. After that you can also buy hard copy shipped at your home at very affordable price. As mentioned, this book is the review book/short book of medicine and is mostly used for USMLE step 2 and other exams. It is written by Steven S. Agabegi and Elizabeth D. Agabegi and published by Wolters Kluwer. Its first edition was written by medicine students because they realized that there were no good review book for medicine. And now this book has four edition and is considered one of the best medicine review book. Connective tissue and joint diseases. Diseases of the urinary and genitourinary system. Fluids, electrolytes and acid base disorders. Diseases of the skin and hypersensitivity disorders. It is one of the standard, best selling medicine review book having four editions. It is one of the best review book of medicine for clerkship, shelf exam and USMLE step 2. USMLE style questions with detailed answers and explanation. It is available online so you would have to buy the hard copy at the end to avail features that are available online. More than thousand quick hits and clinical pearls. 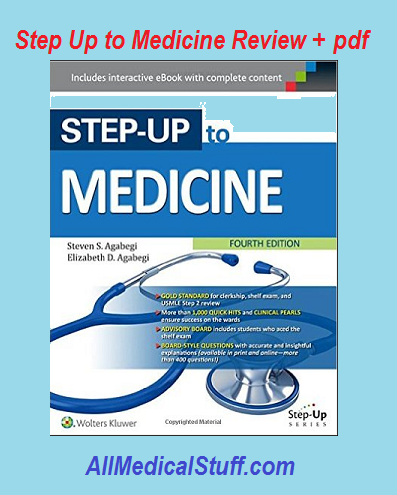 The fourth edition of step up to medicine is completely revised. In the latest edition there is high-yield outline format, quick hits and clinical pearls that are very beneficial for students. In the latest edition, a new 100 question clinically oriented practiced exam is included which is a great resource for self assessment.